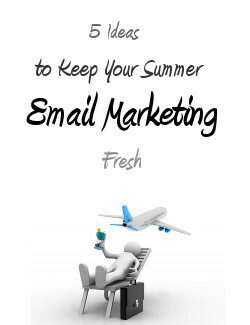 Keeping your email marketing ideas fresh during the summertime can be challenging, considering less people are at their computers and consumers are less likely to read their emails on a daily basis. However, there are many holidays and events during the summer that you need to keep in mind as a marketer, and that you can use to your advantage. It’s entirely possible to catch the attention of your email recipients, as long as you make sure you take the time to rethink some of your email marketing strategies. Summer’s a good time to get creative, so here are a few tips to get you started. According to an American Express survey reported by theGrio.com from last year, many households are expected to spend around $1,200 per person on family vacations. Considering the cost of food, gas, hotels, etc., it’s clear families are willing to spend money on these things, and this is a great opportunity for you to offer them some deals. If you offer a service that ties in with vacations, focus on coming up with an email marketing campaign that will highlight your appealing summertime products and services. Use a travel theme, with bright colors and summer imagery, to really catch their attention. Any company can come up with a great promotion for a summer email marketing campaign in order to drive in more sales during this time. Designing an email newsletter that gives recipients a breakdown of your sales and what you’re offering this season is a great way to keep your customers buying. Before the big sale starts, send out email reminders including photos, coupon codes, discounts, and an enticing call-to-action. Make sure your recipients know that they’ll miss out on a great sale if they don’t buy now. There are so many holidays to focus on during the summertime, so make sure you use them all to your advantage. Although Mother’s Day and Memorial Day occur before the official start of summer, they’re still considered important summer holidaysfor marketers. The Fourth of July and Labor Day are also big summer holidays to keep in mind. Either combine a few summer celebrations or send out separate email marketing campaigns for each one, but make sure you don’t ignore them. If you do run separate email campaigns, offer unique deals that specifically tie in with each individual holiday. Design an email that highlights your products and services and how they tie in with these holidays. If they don’t, focus on using popular imagery for each holiday—for example, flowers and chocolates for Mother’s Day or electronics and sports for Father’s Day. Make sure you offer a deal good enough to entice your customers to purchase from you during the season. The summer season is a great time to run a fun contest. Not only are they simple to put together, but they’ll help grow your email list if you include an opt-in on your registration page. If you can, try offering a prize that has to do with your products and services, like a free item or free session of your service. Make sure it’s enticing enough to get people to enter your sweepstakes and sign up for your emails. Also, make sure you promote the winner when it’s all over, so people will want to enter the next one. Although you should spread the word about your sweepstakes via social media, it’s important to use an email campaign to directly reach all your current customers and make them feel like they have an advantage in the sweepstakes. Send contest reminders and let them know there is only a limited time to enter. Keep in mind that summer is also when recent high school graduates are preparing to head to college for the first time. Since some schools start in July or August, this is the perfect time to offer them deals on the things they might need. If you sell clothes, furniture, or school supplies, building an email marketing campaign that focuses on deals for recent grads will help you bring in more business during the summer season. Design and send out an email campaign that focuses on recent college grads, perhaps by including a printable back-to-school checklist and offering discounts on items they might need. There’s a lot to keep in mind when running email marketing campaigns during the summer season, but there are also a lot of chances to bring in more business if you focus on the right crowds. Does your company plan on focusing on specific summer holidays this season? Do you plan on running several campaigns? Let us know in the comments!